John Parry is an American football official in the National Football League (NFL) since the 2000 NFL season. Parry officiated Super Bowl XLI in 2007 as a side judge on the crew headed by refereeTony Corrente. 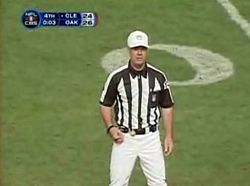 Following this game, he was promoted to referee for the 2007 NFL season following the retirement of Bill Vinovichdue to health issues. Outside of officiating, he is a financial planner and resides in Akron, Ohio. His father is the Supervisor of Officials for the Big Ten Conference.